It looks like Sony's new cameraphone technology will be hitting smartphones and tablets from October. 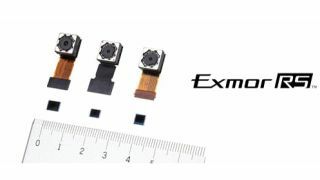 The Exmor RS cameraphone sensor is Sony's (and the world's) first stacked CMOS, which should mean top-flight, pin-sharp performance from a small footprint. There are three levels of sensor under the Exmor RS banner – two 8MP sensors and a 13MP one as well. One of the two 8MP sensors, the IMX014, also comes with built-in signal processing which Sony says will use a wider dynamic range and better colour reproduction without adding pixels. All three sensors should also come packing HDR video recording capabilities. Sony has been focusing on stacked modules as smartphones and tablets get ever-slimmer, which is why it's invested over $1 billion (£635 million) in the tech. The stacked sensors should start appearing in tablets and smartphones from October 2012, so probably won't be found in the Sony Xperia Tablet we're hoping to see at IFA 2012.